I can't believe it has been that long since Wreck-It Ralph (2012) first came out. It's still one of my favourite animated movie. I love the characters and their design, and the story was great too. It's great to see Ralph back in the sequel. Just like the companion artbook for the first film, this book is packed with wonderful artworks. Ralph's world is bigger now with the internet so there are a whole lot more characters to be designed. I'm most tickled by the casual costumes of Sergeant Calhourn where she just can't help by bring weapons along. The internet version of the Disney princesses are included. I like the environment art too. 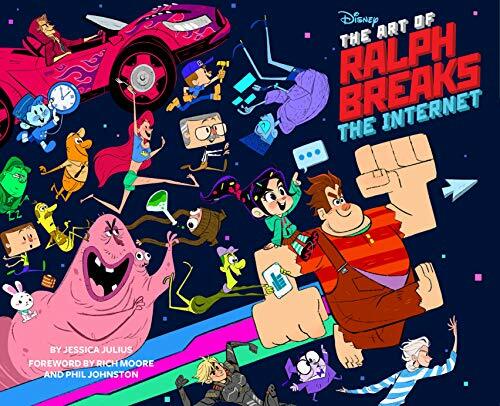 The highlight of the book to me is how the artists interpret the internet and turn all those, sometimes abstract, concepts into visuals. For example, they have to create all those ads that we see online, avatar versions of the characters, internet traffic, eBay auction floors, Youtube office, and many more. This reminds me of Inside Out where the artists have to turn feelings into visuals. There's plenty of text to read. Author Jessica Julius has adopted an interview style with chat windows for the whole book. The text is insightful and really adds depth to the film. If you haven't watched the film, note that there are spoilers in this book. This is a fantastic companion for the film so yes, it's worth the money.